Six artists from Vermont and one from New Hampshire have come together to create a visual representation of Palestinian poet Mahmoud Darwish’s poem “Think of Others” in collaboration with Vermonters for a Just Peace in Palestine/Israel (VTJP). 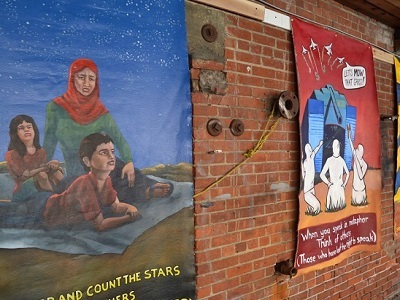 The ten panel display debuted at the 2016 Burlington Art Hop exhibit this past September, offering visitors a new interpretation of one of Palestine’s most renowned poets. The detailed paintings inspired by the poem depict the apartheid wall, and refugees sleeping under the stars or standing in the direct path of a tank. “I was taken by it completely,” Wafic Faour, a Palestinian resident of Vermont and member of VTJP, said upon first seeing the artwork. Darwish, who died in 2008, is well-known as a Palestinian poet-laureate and for his contributions to the Palestinian cause. Born in 1946 as a Palestinian, then living as a refugee in Lebanon as a child, Mahmoud returned to his homeland and was jailed multiple times for his poetry against the Israeli occupation. Darwish lived much of his life on the run and was often covertly smuggled by his allies over land and sea to safety. “Think of Others” is the VTJP’s second public art installation, following a ‘street comic’ last year about the life of Najawa, a fictional Palestinian woman navigating her country throughout the decades of occupation. 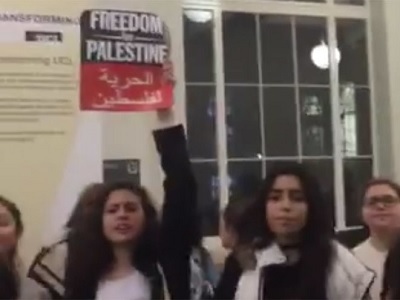 Alongside the artwork at this year’s Art Hop exhibits and events, VTJP volunteers also took the opportunity to spread the word about their other efforts, including a boycott of Ben & Jerry’s Israeli franchise in protest of Israel’s occupation and militarization of Palestine.